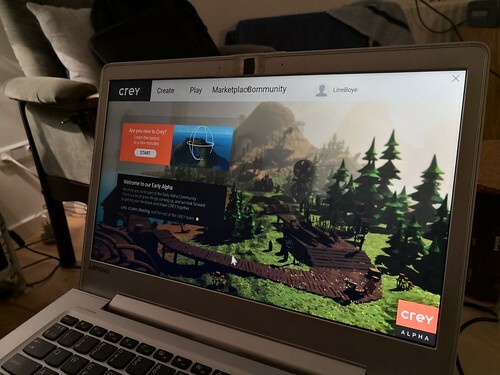 CREY is a creative open-world platform originally developed for users to create their own game. They wish to develop CREY SCIENCE as a platform specifically aimed at university students. Our challenge was how to make CREY a relevant & engaging tool for students & teachers to use throughout their studies. We have developed a concept called CREY MEMORY: an individual interactive memory palace in the program helping students visualize what they have learned. We wanted to include a collaborative element to it making CM a desirable platform for continued use throughout the students’ education. Therefore it’s possible to co-create in CREY MEMORY sharing knowledge and solving problems together. You can create material yourself and simultaneously include videos, audio, pictures and text from other sources. 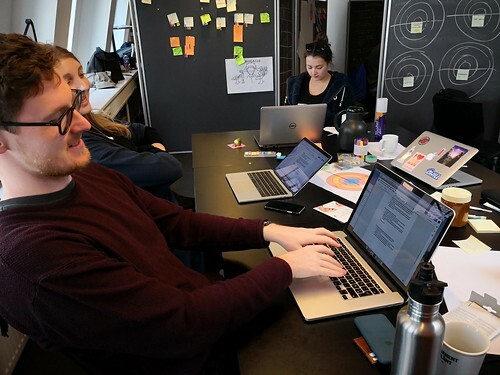 Although we primarily focused on CREY MEMORY, the platform itself could then serve as a flexible tool for students in their learning and collaboration. CREY Memory is an interactive memory tool that helps university students visualize and remember what they have learned. In CREY Memory, students can build their own memory palace both individually and collaboratively. We imagine a platform utilizing tools as known from CREY Games (i.e. molding, colouring & interactive elements) combined with the ability to include videos, audio, text etc. from other sources. Furthermore, students will be able to use Google Image search to find the objects they need to remember the names of. In groups they can create a shared place to visualize and memorize projects and ideas. After the talk with Carsten from CREY SCIENCE at the first day, we wanted to talk with university students to collected their thoughts about learning, memory and how to learn. We wanted to talk with the student because CREY SCIENCE were challenged to involve them in their project. However we also choose to interview teachers in order to include their aspect of learning and understand how they are planning their lecture. This to if they would be able to involve CREY in their teaching. Since CREY SCIENCE is not developed yet we could only present CREY Games to our participants. Since CG is inspired by Minecraft we wanted to interview university students that had experience with gaming and Minecraft. We therefore divided our interviews into three groups; University students, teachers and gamers. We planned the questions together in the group and made a semi-structured (Kvale & Brinkmann, 2009) interview plan, so we could compare the answers afterwards. But only semi-structures because we also wanted to make room for individual aspects and thoughts besides what we talked about in the group. Learning tools that they are missing: Drawing, storytelling, pictures and text. We presented the data to each other while simultaneously writing down keywords on post-its. 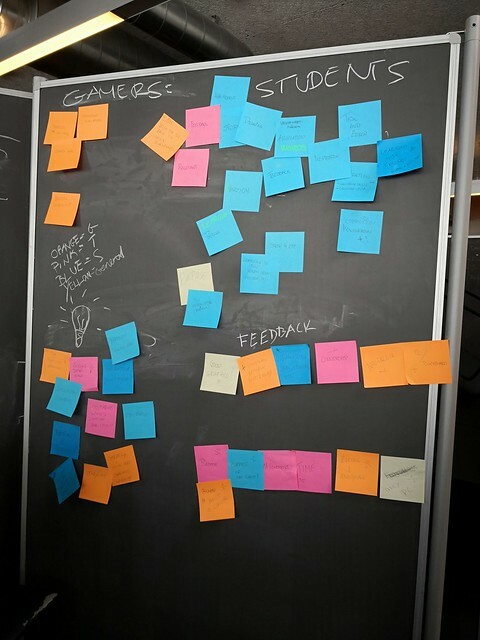 We then got a lot of post-its with ideas, feedback, how they learned, etc. After that we used the Core design framework (Rosenstand og Vistisen 2016) about feature og content quality criteria. We used their framework to come up with different ideas, based on the data we collected compared to the challenge presented by CREY. 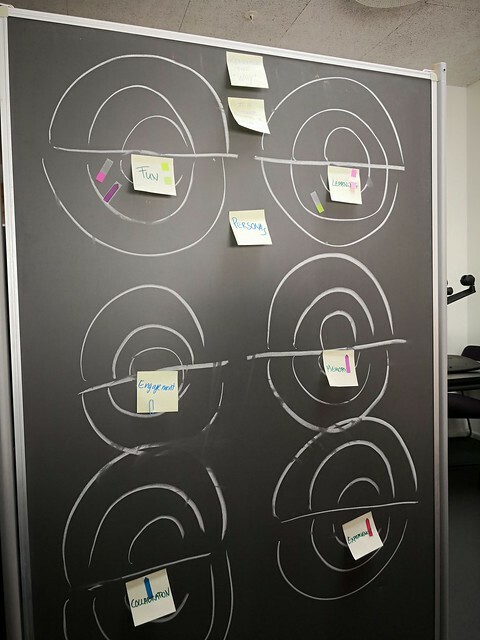 The great thing with this framework is that we put our own keywords in the circle and developed new ideas in different contexts. And then to compare what if we had “fun” in the core compared to the learning aspect. 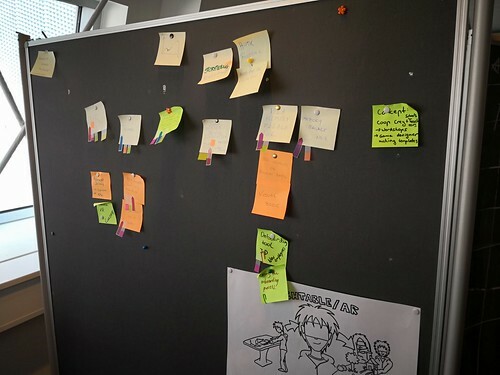 The keywords that we did in the framework: Fun, learning, experience, collaboration, engagement, memory, time-saving, visualization, competition and marketing. We discussed what would happen if we put “Learning” in the middle instead of “Fun” and so forth. Ultimately we decided that it’s about providing an experience while memorizing, learning and having fun (in that order). In both learning & having fun you can have collaboration and be engaged as well. 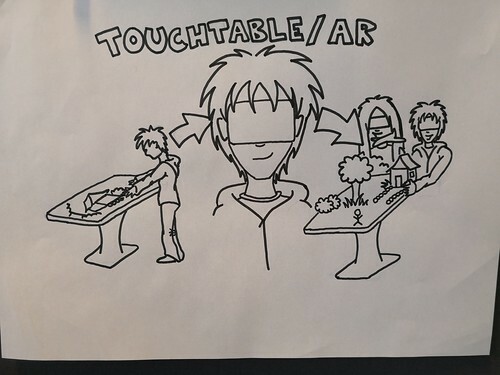 In sketching the concepts we agreed upon trying out the touch table as a technology to see how that worked. 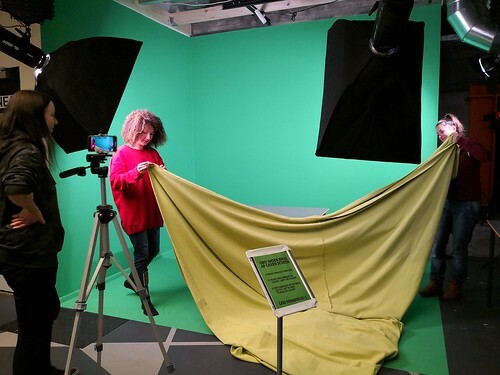 We then used greenscreen for both touch table and also an idea of a virtual room that sprung out of the sketching process. In the end we decided to focus less on existing technology and more on experience. 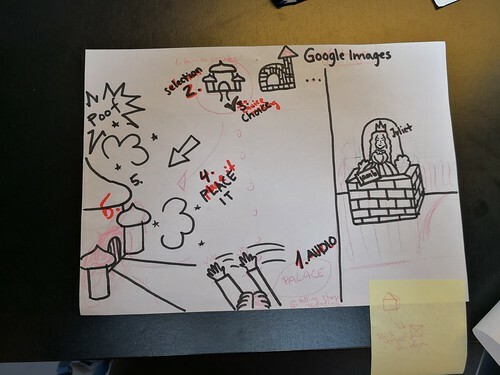 This was also after our second meeting with the casepartner where we presented the initial sketches (pictures shown above) where we discussed if the technology itself really was the important part – instead we developed CREY MEMORY as a concept that could be applied to any imaginable technology, but for simplification the final concept video shows students using computers. 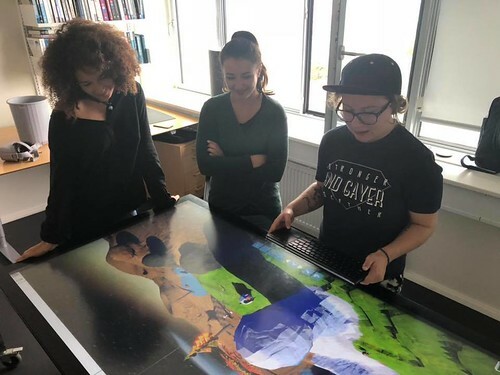 By sketching through animation (Löwgren 2004; Vistisen 2016) we were able to explore fictional scenarios surrounding our concept ideas without having to develop a functioning prototype. It was especially important for us to show concrete examples of how we imagine the students using CREY SCIENCE. In your scenarios we both addressed the feedback we got from our interview participants, combined with our answer to our own “what if”-questions (i.e. 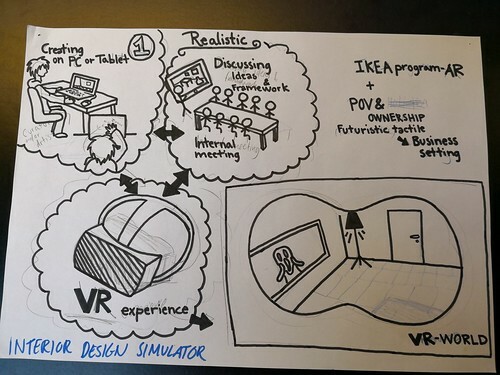 “what if we could sketch in the air?”, “what if we were able to do problem solving in virtual rooms?”, “what if the students don’t want to build themselves?” etc.). This concept involves the use of a touchboard, which make a great tool for both personal learning as well as collaborative work. We use this touchboard as a visualization tool for CREY SCIENCE as a way of making the process of building your memory palace easier, more fun and more future oriented. In this concept you can as an example place a rose, which might help the user remembering the name Rose from the movie Titanic. 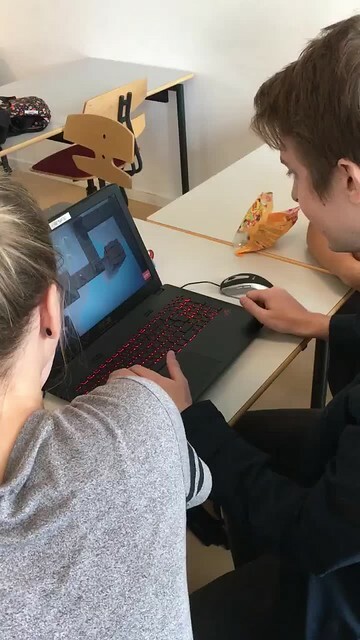 We also experimented with using a “wand” to zoom, rotate an AR-version in the air and sketching the desired items in air as well. The search function presented in the video would be connected with Google Image search as well. The concept in this idea is that every student can make their own memory palace (which is our main concept). In the memory palace they can put words, images and text in rooms or spaces, which will help them remember the words and images e.g. The heart on the bed and the latin words on top of that or the bacteria on the floor because the floor is empty. Or whatever makes sense to the individual student and helps the student remembering the curriculum. This concept we came up with after the concept idea #1 because we wanted to try a different field within the university but besides medicine. So in this memory palace you can imagine that instead of reading a book and look at a timeline you are instead walking down the timeline. In our video you see the year 1939 and images of Germany and Poland and a gun to illustrate that Germany invaded Poland during that year. However it is important to remember that you can change all that and do what makes sense to you. The peace image in our video illustrates the end of the war in the countries afterwards, but you can change all that so the student will remember it after what makes sense to the student. The virtual room concept is about having a virtual reality place in which each student/person could spend their time however they like. They could build their dream room or place, in which to escape from reality. For example, they could play games by themselves or invite friends to join the game. Likewise, friends could participate in the game, making it a co-op experience. You can send an invitation via email or just call your friend if they are online. This concept is a futuristic idea because it involves teaching the students who are going to be teachers. The pre-teachers. So if we teach them to use CREY SCIENCE in their school then, when the students become teachers themselves, they can use CREY SCIENCE in their lectures and teach their student to use it. The concept could be a part of a five years-plan for CREY SCIENCE. Kvale, S., & Brinkmann, S. (2009). Interview: introduktion til et håndværk. Kbh. : Hans Reitzel. Scupin, R. (1997). The KJ Method: A Technique for Analyzing Data Derived from Japanese Ethnology. Human Organisation. 56(2). Vistisen, P., & Rosenstand, C. A. F. (2016). 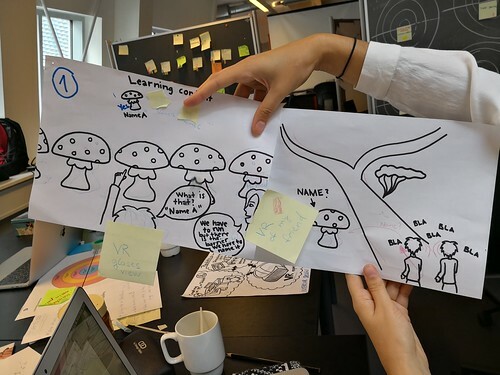 Facilitating Consensus in Cooperative Design Processes using animation-based sketching.